On Thursday 10th May, some of our Year 5 pupils went to St. Swithun’s school to take part in the Trinity - Big Sleep Out School’s Shelter Building competition. Each school team at the event had to design, plan, and build a shelter with support from volunteers from Osborne Construction who also provided hands on advice and skills. Throughout the day, our Year 5 children also had the opportunity to visit the RS Truck Experience, looking at engineering and technology now and in the future. 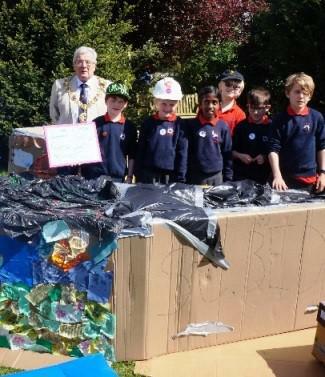 We are very proud of all the children who represented the school at this event and as you can see in the picture below the Mayor of Winchester was very impressed with the final St. Bede shelter. Excellent work!